Charter the Aquavit II with Captain Jon Moore and enjoy an original combination of experience, hospitality, and flexibility that no other boat rental company on St. Thomas can match. Jon has been living in and around the local waters since 1976. During this time he has developed an intimate knowledge of how best to enjoy his beautiful Caribbean home. Whether you prefer snorkeling, sunbathing, beach bars, sightseeing or anything in between, Jon knows the best places to go and equally important, the best times to go there. Combine these attributes with extremely flexible hours and you have the recipe for a perfect day. You can swim with the turtles at Buck Island in the morning, and then explore enchanting reefs and mangrove lagoons in the afternoon, or create a more relaxed charter focused on cruising, cocktailing, and beach hopping St. John and the British Virgin Islands. Hourly, half-day, and full day rates are available to fit any schedule. The best way to explore the Virgin Islands is by boat. Book your adventure today! For more information, or to make a reservation contact our head PASA Certified Kiteboarding Instructor, Jon Moore at 340-998-6240 or email info@adventurewatersportsvi.com for more information. We require a $100 deposit for all kiteboarding reservations, which is forfeit if you cancel within 24 hours of the lesson or fail to show up. The classes begin with a quick five to ten minute boat ride over to Cas Cay in the East End Mangrove Reverve. 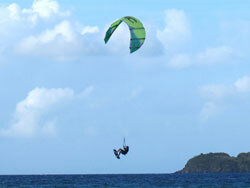 The shallow water grassy flats surrounding this pristine islet provide the ideal training ground for kiteboarding. 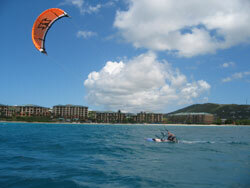 Instructor Jon Moore has been giving kite lessons on St. Thomas since 2004 and knows how to make the most out of a wide range of wind and weather conditions. The fifteen foot custom skiff “Whitecap” provides transportation to the lesson site as well as a stable platform for safety briefings, beginner instructions, open water coaching, and kite setup and launch. Because kiteboarding is a weather dependent sport similar to surfing and snowboarding, Jon endeavors to keep his lesson schedule flexible in order to catch the most favorable wind conditions for his students. The focus of every lesson is to provide a fun, safe, and informative experience for kiters of all skill levels, from first timers to experienced riders looking for a safe spot to push their limits. So come on out for a kite! The key to riding a kiteboard is kite control, so Jon has designed this first lesson to teach his students how to fly a four line inflatable kite in the water as quickly as possible. After a briefing on safety and basic kite flying technique, it is time to pump up the kite and get into the water. The terrain of the mangrove lagoon allows for the use of a kite big enough to make the transition from kite flying to boardwork a smooth one. Once a student has learned how to control the kite with one or two hands, and they can change direction when necessary they are ready to start working with the board. Nothing in this tricky sport is ever guaranteed, but given the right wind and personal ability it is possible to get up and riding on the board by the end of the first lesson. If you have already taken your first lesson with Jon, or you learned how to ride somewhere else this is the lesson for you. A full sized kite and plenty of wind are the name of the game at this stage of kiteboarding. Once the student is up and riding Jon shadows them in his skiff to provide coaching, safety support, and transport back upwind. Depending on your skill level you can work on a combination of basic get up and go riding, upwind riding, transitions, jumps, or tricks.